« Cage Free, Humanely Raised, Think Again! 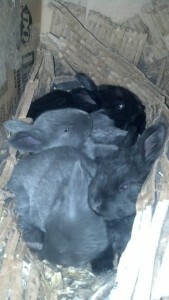 Silver Fox rabbit kits just under 3 weeks old. It has been just under 3 weeks since two of our Silver Fox does kindled. It has been cold most of that time so we have only seen two of the kits venture outside of their nesting box. We checked in on them today to see how they are progressing and were pleased with the result! They all appear to be growing well and are developing nicely! These rabbits will start to be weaned from their mother at around 5-6 weeks of age, depending on their size. That means we will have our first Silver Fox breeding stock for sale in about 3 weeks from now! At about 8 weeks or so we will take the rabbits that have not sold, and are not needed for our breeding operation, as meat. So we will have our first rabbit meat available in mid January! If you are interested in reserving any Silver Fox rabbits for your own rabbitry sign up for our newsletter on the right and/or send us a message. They will be available for $45 each with discounts for multiple purchases.